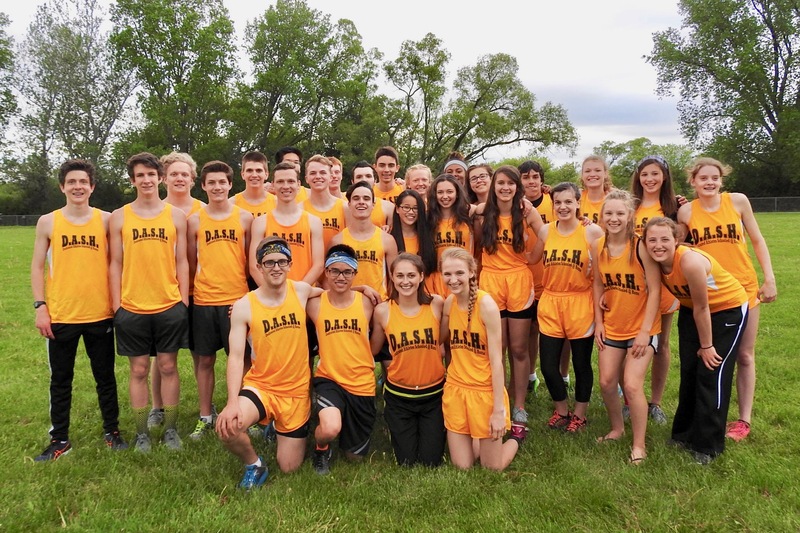 The full DASH high school cross country team was in Racine on Thursday to compete in The Prairie School Invite. This is a meet that we think about and prepare for as soon as we start practicing each August. The goal is, and has been all along, to be peaking now with hopes that all the miles we have put in would be enough to have us come out on top in meets like this. Nine other teams were on hand to race the meticulously groomed Armstrong Park course. The DASH fans would be in for a treat, watching the race develop on the very fan-friendly course. The girls lined up at 4:15, and right from the gun a pack of DASH yellow was seen surging near the front. Abby Chu led the race for about 2 1/2 miles until finally being run down by a very good Prairie School girl who also won this race last year. 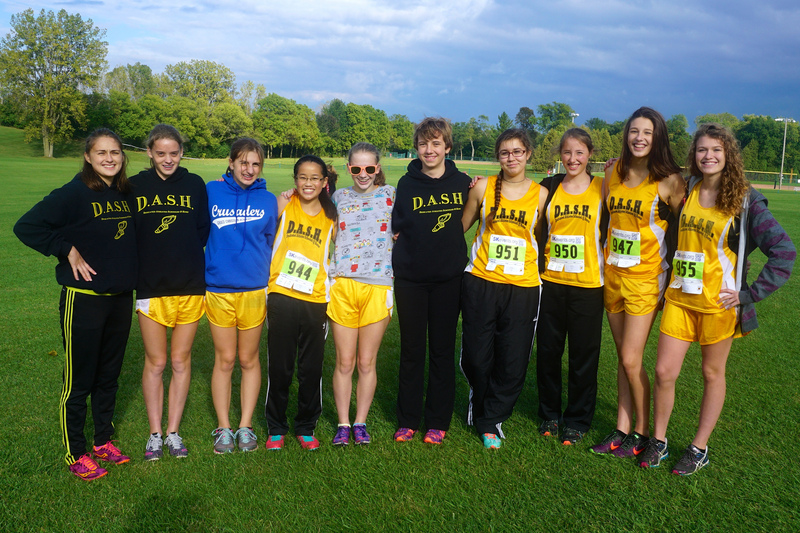 Abby gave it her best, and was pushed to another personal record, which is also the new DASH record, of 21:22. Abby has raised her level to new heights all season. It has been a joy to watch. Stephanie Chu ran in 3rd place almost the whole way, and cruised to the finish 21 seconds ahead of her closest competitor. Stephanie made 22:11 look routine. She is running that good. Terez Wycklendt and Alivia Kempf turned the team race into a route with their 5th and 6th place finishes. We had four girls in and the clock had not struck 23 minutes. That was a first for the team, and it had everyone from all the teams talking about ‘those DASH girls’. Alivia has come through for us each time out. Now with Terez rounding into form and keeping up with her, we are running on all cylinders. Emma Taylor continues to close the gap on her teammates ahead of her. She has never looked better, and broke 24 minutes for the first time with a 23:51. That gave us 5 of the top 11, thus clinching the team race in our favor. Ella Johnson lowered her personal record by 10 seconds with a 16th place 24:42 effort. She is practicing well, and running with confidence. Katie Gorectke was back in action after missing the last meet. She looked good the first half, then the training she missed while healing up caught up with her. She finished with a respectable 25:51. If Katie stays healthy from here, that time will be coming way down. Faith Caspers ran with the JV team for the first time because she just hasn’t been able to match her times from previous years, and because we have so many girls running well in front of her. She made the most of it, winning the JV race in a sprint to the finish with the 2nd and 3rd place girls both just a few seconds behind. Katrina Lipski continues her big senior season, this time racing in with a personal record 27:33. That was good for the 4th place JV medal. Naomi Zhou has improved her time each race, a feat only Abby and her have accomplished this season. Her 32:28 is a 5 minute improvement since the start of the season. Shariah Hyler was the next runner in after Naomi. She is still teasing us with her nice stride that gets interrupted with occasional walking. She is due for a breakout race. Sandrelee Velez missed the last race because of injury, and struggled through the course. If she can stay healthy and put in some good practices in the next 12 days, we are going to like her times. Trust the coach on this one. 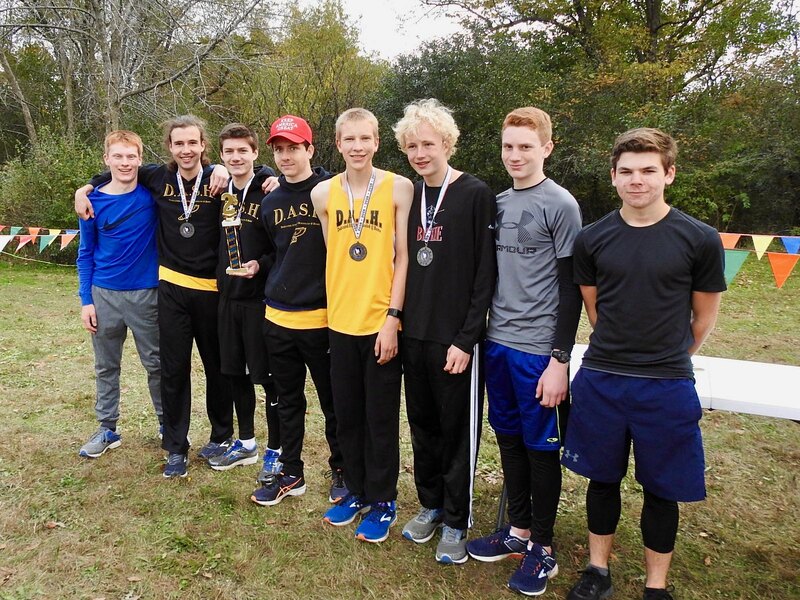 While our girls were the pre-race favorites, the boys race was set up for a very close 3-team battle between the defending champion Prairie School team, Brookfield Academy, and us. On paper it looked like the race could easily be decided by the team with the best 5th runner. At 5:10, the gun went off, and the jockeying for position began. Brookfield Academy got off to a very good start and looked to have the early lead as the boys headed for the loop around the buildings to the mile mark. Our boys were running well, but in the front two BA boys were leading everyone through the course. While the two BA boys would go on to place 1st and 2nd, behind them the race would be changing considerably before it was done. The Prairie School team started moving up and becoming a factor again, eventually getting their number 1 ahead of Caleb Schaber. Caleb then held down the 4th spot the rest of way and broke 18 minutes for the second meet in a row with a 17:56. That is just we needed from Caleb. Alexander Taylor was able to stay ahead of BA’s 3rd runner from the start which is what we had to have him do, but through the 2nd mile, Drake Hacker and Kaden Hacker both moved in front of him as well. Meanwhile BA’s 4th and 5th runners started to fade some while Joshua Schaber and Vincent Maurer stayed strong, both eventually getting ahead of them. The lead was ours. We just needed to play some defense the rest of the way, but instead the boys just kept turning up the heat and ran away with it. Alex hit the finish in 8th place with a personal record 18:42. He was followed by Drake Hacker who had a season best 19:06. And Drake was followed by Kaden Hacker who had a personal best 19:10. Yes, we had put 4 in the top-10! Then Joshua and Vincent clinched it with some big efforts of their own. Joshua kept his lunch down long enough to break 20 minutes for the first time with a 19:59 18th place finish. Vincent finished 19th with a season best 20:09, coming in ahead of The Prairie School’s 5th, and Brookfield Academy’s 4th and 5th. We have had some disappointments on this course the last 3 years, but this time the day was ours. The race didn’t really come down to who had the best 5th runner after all. We had won too convincingly. Jacob Parker had been sick earlier in the week, and faded some after a great start. His 21:57 was respectable, but he will be giving us more than that in the remaining races. Matthew Schaber placed 5th overall in the JV race. It was a good effort and got him to the medal stand. It was good to see Jacarie Rucker get to run. He had a good start, and then tailed off a little to finish in 25:55. John Shane ran the last half close behind Jacarie and lowered his personal best by 1:40. Nice. The medals went to the top-15 varsity runners, and top-10 JV runners this year. That had a few of our athletes just missing out, but we still ended up with 9 varsity and 3 JV individual awards. 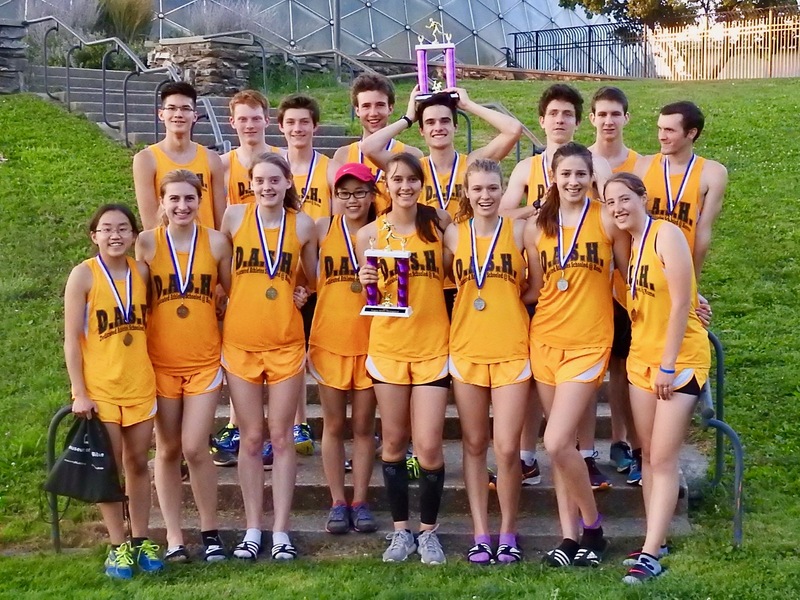 More importantly, we came away with both the girls and boys 1st place team plaques, a first at this meet. Now we have 12 days of practicing ahead with the goal of getting just a little better in the remaining weeks ahead. Thanks to Ed Beck and birthday girl Dawn Kempf for their help with the coaching. Thanks to The Prairie School for hosting another great meet on such a nice course. Thanks to all who made the drive down to Racine. Thanks to all the athletes who came ready to race. Thanks to the camera lady and Julianna Caspers for getting some great photos on my camera. Using Emma’s camera, Abby Taylor helped out in getting some great photos of the girls race. She was a little slow in getting to her spots and missed Abby a few times, but if we can get her to practice that will be corrected. And Emma Taylor transformed herself from DASH star to team photographer for the boys race. Thanks to all the photographers who were able to capture the moment in photos for everyone to enjoy. Now everyone stay healthy so we can do it again soon. I hope to see you there. 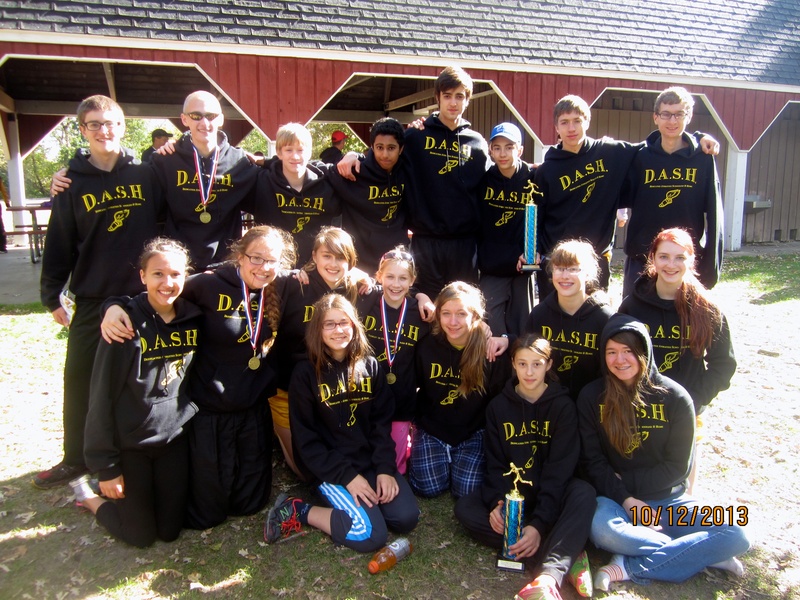 The DASH high school cross country team was at the Mitchell Park Domes yesterday to compete in the annual Trojan Invite. The team has raced this meet every year since we have had a high school team, so this would be our 11th time here. The race is a little smaller now than it was years ago, and they changed the course about four years ago after some construction at the park. But the meet has remained a place where we can get in a mid-season race against some smaller teams, win some awards, have fun in the more relaxed atmosphere, enjoy the setting of the Domes in the background, and help us get ready to peak for our big end-of-season meets left on the schedule. The combined boys and girls JV race was first at 4 PM, but traffic was bad and only two of our girls made it to the start. Shariah Hyler got out fast, and then after the usual ups and downs of an athlete that has only been doing cross country for a few weeks, showed off her nice stride at the finish and lowered her personal record by over a minute. Shariah’s 31:28 won her the 6th place ribbon. She could be really good if she sticks with it. Naomi Zhou had her best race of the year. She was tired at the end after pushing herself to a season best time of 33:18, and won the 12th place ribbon. Many teams ran their whole teams in the JV race, so the girls 6th and 12th place ribbons were hard earned. Unfortunately, Jacarie Rucker could not get out of school in time, and was unable to stay for the varsity race. I would have loved to see him run. 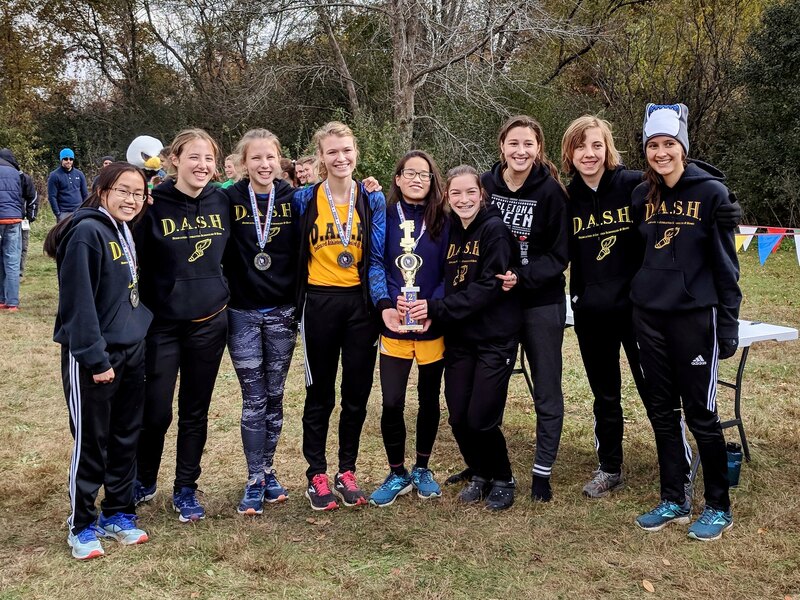 The girls varsity race was very small this year after so many teams foolishly ran their best girls in the JV race, but we did have just enough fast girls line up with us to help push us along. Abby Chu may have been the one exception. No one pushed her for long. Abby broke away from the pack before the half mile mark and never looked back. In the windy, cool conditions so unlike last year, Abby kept up her relentless charge all the way to the finish, lowering her own DASH 5k record with a 21:31. That was fun to witness. Stephanie Chu made her own break away in the last mile and came to the finish all by herself while claiming the 2nd place medal for the second consecutive year. Stephanie’s 22:04 effort was so impressive. Alivia Kempf stayed strong throughout, and finally dropped a very good Greenfield girl down the home stretch to finish 3rd place by nine seconds with a personal record 22:22. These three girls were amazing. Terez Wycklendt finally made it to the starting line after missing our first four meets with some foot and knee issues. The expectations for Terez were super high after she won our team race back in mid-August, but she followed the game plan and did not push herself too hard this time out. Terez stayed with Stephanie and Alivia for over a mile before dropping back and holding down 5th place. A Carmen girl was coming up on Terez fast and gave her a race at the end, but Terez proved too strong. The 5th place medal was hers with a nice time of 23:48. Well done. If Terez can finish three more times for us this year we will be ecstatic and relieved. Emma Taylor looked so good out there you would have thought it was track season. Emma kept her arms pumping the whole way and hardly looked tired while posting a big personal record of 24:30 to place 8th. Our 5th spot is becoming a strength with running like that. Ella Johnson really pushed herself at the start, and then got in a nice rhythm which she maintained to the finish. Ella has worked hard, and is in top form now as her personal record 24:52 time shows. The 9th place medal was hers. 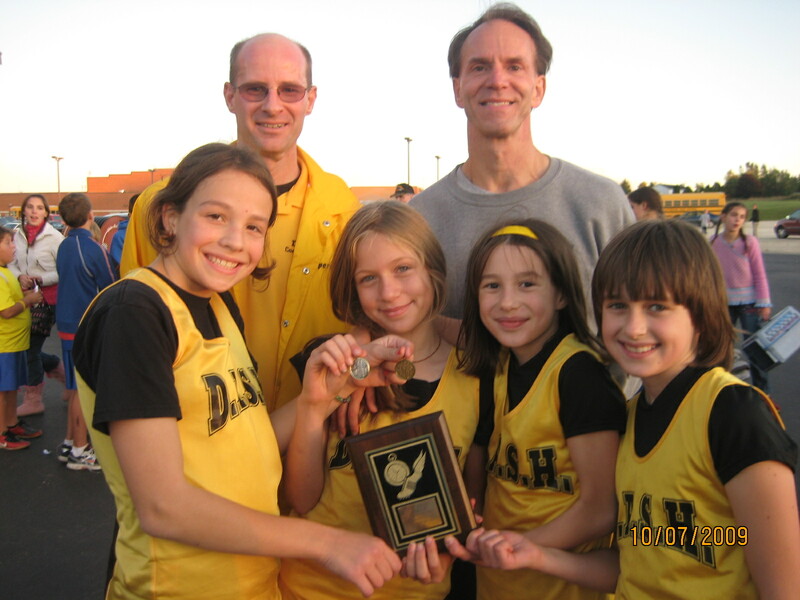 Was Ella really on the JV team the first meet? That seems a long time ago. Faith Caspers found herself running all by herself like she often does for some reason. She finished with a season best 26:22 for 10th which is encouraging. Hopefully her time will be coming down a lot more in the big meets ahead where the fields will be much bigger. Katrina Lipski lined up with the varsity runners and broke 28 minutes while winning the 12th place medal. Katrina was superb, and everyone was so happy to see her come away with a varsity medal. That also made it a clean sweep for us, with all 8 of our varsity girls winning top-15 medals. We have never done that before. These girls were special. The boys varsity race was a little smaller this year as well, but the competition mixed it up with us pretty well. Caleb Schaber broke away from the pack early just like Abby did, but then a very good Messmer athlete started making his move toward the front through the second mile. Caleb and the Messmer boy would jockey for position the rest of the way, all while getting about a full minute ahead of everyone else. It was fun to watch Caleb battling for the win, but he would have to settle for a big personal record time of 17:48 and the 2nd place medal this time. Caleb looks to be ready for a big finish, and we will need that from him. Alexander Taylor got into good position early and then put it on cruise control. He was impressive after having ankle issues last race. His 18:46 won him the 3rd place medal. There would be three freshman in the top-6 with Alexander being the first one to the finish. Drake Hacker put in a good workout. He ran comfortably in 4th most of the way without getting pushed much. Drake also looks to me to be ready for a big finish. Kaden Hacker was running in the top-10 the whole way, and he did find a few athletes to battle with. Kaden came through with his usual big finish, moving up to 6th by the time he was done. That gave us 4 of the top 6. All the DASH fans liked that. Our 5th runner in was sophomore Jacob Parker, running varsity for the first time. Jacob really came through for us as we started without Joshua Schaber this time out. Jacob is running with confidence, and is looking so good out there now. He lowered his personal record by over a minute with his 20:48 and got himself on the medal stand with a 14th place finish. It was the fifth medal for the boys. The first place trophy would be ours again. Matthew Schaber was also running varsity for the first time and made the most of it. He lowered his best time by over a minute and a half with his 21:18 17th place finish. This was the breakout race we have been waiting for. Well done. Vincent Maurer was on his way to another top-15 finish, but was then slowed by a side cramp, and ended up with a 23:05. Vince was running his best race of the year for the first two miles, so I am not too concerned about one of our long-time stars. John Shane lined up with the varsity boys after arriving too late for the JV start. He is a week or two away yet of really putting a full race together. He posted a 28:14 time. That will be coming way down as he gets in some more practices. We won both team trophies as expected, but the important thing is the trophies were won on a day where we ran very well. The weather was perfect for running fast for 3 miles, and we made the most of it with 11 of our 18 athletes setting personal records. We are obviously peaking now as we should be, and that can only get you a little more excited about the final three weeks of the season. Thursday in Racine is next on the schedule. We are always one of the contenders down there, but it is never easy. We will have to run like we did today, and maybe a little better to come out on top. The course is a great one to watch a race develop. I hope to see you there! 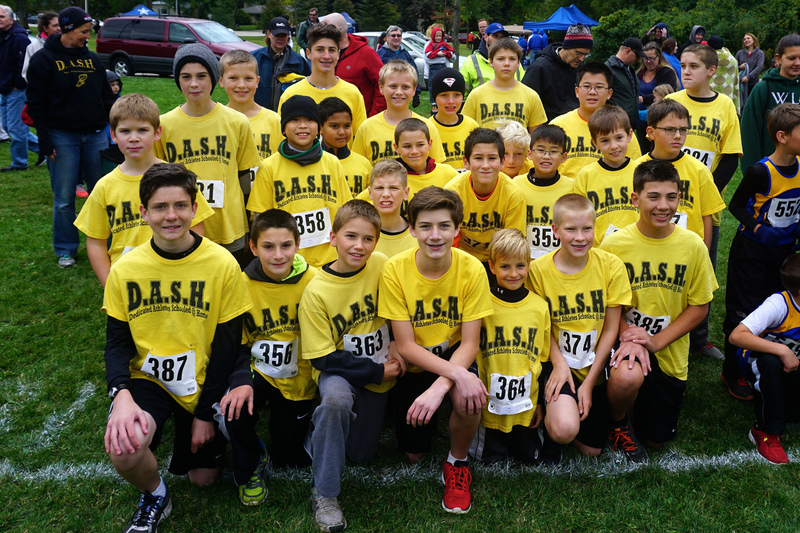 We had a great group of DASH fans lining the course. Thanks to everyone for doing what they can to keep the athletes energized. Thanks to the athletes for giving such great effort while showing off their talents. Thanks to Mrs. Kempf, Mr. Maurer, and Mr. Beck for their help with the coaching. Thanks to Joshua Lipski and Mr. Beck for being our official scorers. They were flawless. Thanks to the camera lady, along with Julianna and Grace Caspers, for helping me get some great photos. And thanks to Emma Taylor for lending us her camera at the end when our battery ran out, and then sending me all the photos taken from her camera to include with the others. The photos were a lot of work this time. Be sure to check them out, as they capture the highlights of another great day of DASH racing. 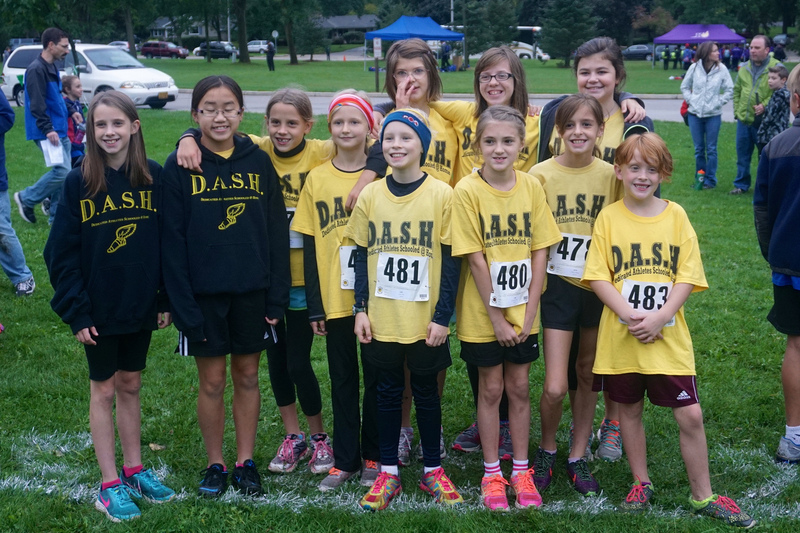 The full DASH cross country team competed in the very competitive Waukesha Cross Country Festival last Saturday at Minooka Park. The high school team would be facing mostly Division 1 schools, and the middle school team went up against a couple of all-star teams running under the West Bend West and Wisconsin Lutheran names besides the usual good teams we face here. Overall, we would be up against our stiffest competition of the year with hopes that it would bring out our best, and toughen us up some for the last four big weeks of racing left on our schedule. Katrina Lipski led the JV girls around the course in the first race of the day at 8:30. Katrina put together one of her best races ever as she hit the finish in 28:35. If I have to leave her on JV, she should be near the front in all our remaining races. Sandrelee Velez led Shariah Hyler up the big hill to the finish, but Shariah came in just ahead as they went down the short hill to the finish. The girls times were both in the 32’s, cutting off close to 4 minutes from their times last week. Very good progress, girls. Jacob Parker got off to an amazing start in the boys JV race, running in about 3rd place at the half mile mark. But then, unfortunately, he would be slowed by an ankle sprain and hobble in with a 27:46. If Jacob can heal up and be ready for the next race, he will be running with the varsity squad. Matthew Schaber gave us another steady race, making it to the finish unscathed in 22:55. He looked pretty fresh at the end which means he is ready to push his times down much lower. 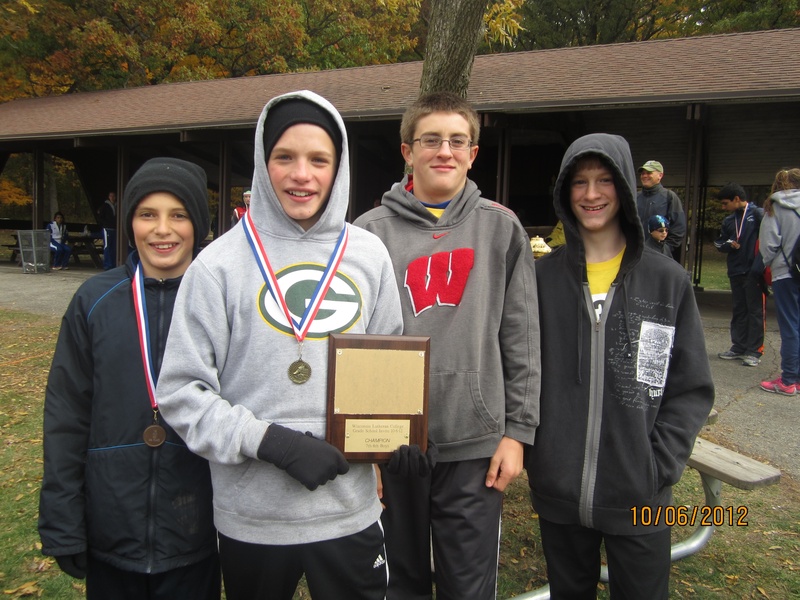 John Shane was in his first cross country race, and handled the very tough Minooka Park course pretty well. He has some talent. He just needs more practice time. The varsity girls took the next shot at conquering Minooka. Abby Chu proved up to the task as she flew through the course in just 21:46. That was good enough to get her a top-20 medal, the team’s first ever at this big meet. Wow! Stephanie Chu was 29th overall with a personal record 22:18. Those who set personal records at Minooka are ready for a big second half of the season. Keep your eyes on Stephanie. Alivia Kempf’s 23:07 time was faster than any of our girls ran last year, meaning the girls were having an epic day thus far, but the Minooka course bit back and it was Katie Gorectke who was the victim. Like Jacob before her, Katie rolled her ankle after a good start and never did make it to the finish. Emma Taylor toughed out a 26:23, and to her credit wouldn’t let Faith get by her, but the Minooka course did wear on Emma. Faith ran well for awhile, coming in just a fraction of a second under 27 minutes, but her best times of the season remain future. Ella Johnson was moving up on Faith near the end and settled for a 27:15. Now she can look forward to one of her favorite courses next. Naomi Zhou missed the JV race, but we found room for her in the varsity race. She was a little over matched, but did manage a season best time. When the points were counted the girls came in with a very respectable 11th place finish. I think I sense big things ahead for the girls. Caleb Schaber led the varsity boys once again, finishing with a routine 18:44. We will need Caleb to come up even bigger in the weeks ahead, and I think he will prove up to the task. Drake Hacker looked confident while running to a 19:15 time. He is slowly working his way up close to Caleb now. I like that. Kaden Hacker is really turning heads each time out. He battled until the very end, and maybe even left the Minooka course a little humbled, moving up to finish just a split second behind Drake while setting a personal record in the process. As I said earlier, those who set personal records at Minooka are ready for a big second half of the season. Keep your eyes on Kaden. So far, so good, but at Minooka it rarely ends up all good. For the third race in a row, an ankle sprain would slow us down. Alex Taylor would be the latest victim. Alex would finish, but his 20:45 put him almost 2 minutes off his best. Joshua Schaber and Vincent Maurer both had descent races, but ended up in 100+ place running in such a tough field. They will stack up much better in our races ahead. If Alex can bounce back fast, the boys look to be ready to have a big second half. Our long day continued. We were on to the middle school girls. Julianna Caspers stayed near the leaders and broke 10 minutes over the 1.4 mile course. That effort earned Julianna the 2nd place 6th grade medal. Bedalia Radtke really picked it up after a conservative start, and was the next 6th and under girl to hit the finish line. A 10:54 from Bedalia won her the 3rd place medal. Very nice. Mary LeSac proved her great result from her first race was no fluke. She followed it up with an 11:44 12th place finish. Our 6th grade team score was looking good. And our next girl in was another 6th grader. Julia Kowalinski made her season debut with an 11:50. Not too bad, but long-time star Julia should be even better in the meets ahead. Julia was followed by yet another 6th grader, Grace Caspers. Grace is getting fast now and hopefully putting her knee issues behind her. Just like that, we had our first five 6th grade division athletes in. Our team score was complete. 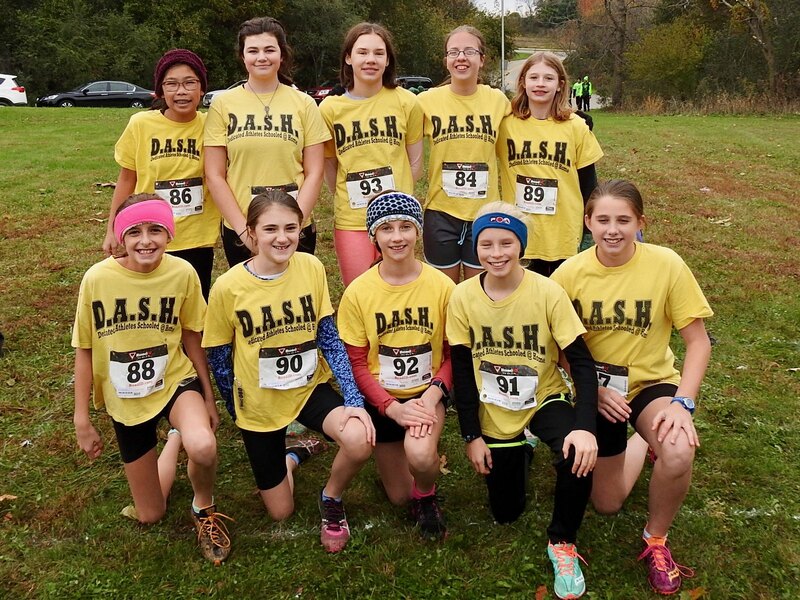 When the results were posted, the girls had overwhelmed the competition, winning the 6th grade race by 30 points with a team score of just 40 points. Our young girls are living up to their potential so far this year. Rebecca Anderson and Jenna Walters ran close through the course with Rebecca coming out just ahead. Both girls posted 13:38 times. These two 8th graders are very close and should push each other all season. Alexa Bruton posted a 14:08 and remains close to really pushing her time down. Natalie Radtke went out really, really fast down the big hill, and then really fast up the big hill on the way back. Once she gets better at the middle part of a race she will be a star. Mary Claire Egan picked a tough course for her first cross country race. She showed us some potential and posted a nice 16:25 time. The middle school boys were saved for last and they did not disappoint. Abiah Radtke had a fantastic finish, edging Zackery Meyer at the line with both boys posting identical 8:49 times. This was Zackery’s first DASH race, and he was impressive. Zackery can make it to the Saturday races, so hopefully we will see more from him in the weeks ahead. But as good as Abiah and Zachery ran, they just missed out on the medal stand. The 8th grade division was amazingly tough this year with the top 15 boys all being in that division. Nathanael Chu on the other hand posted a routine, for him, 9:07. 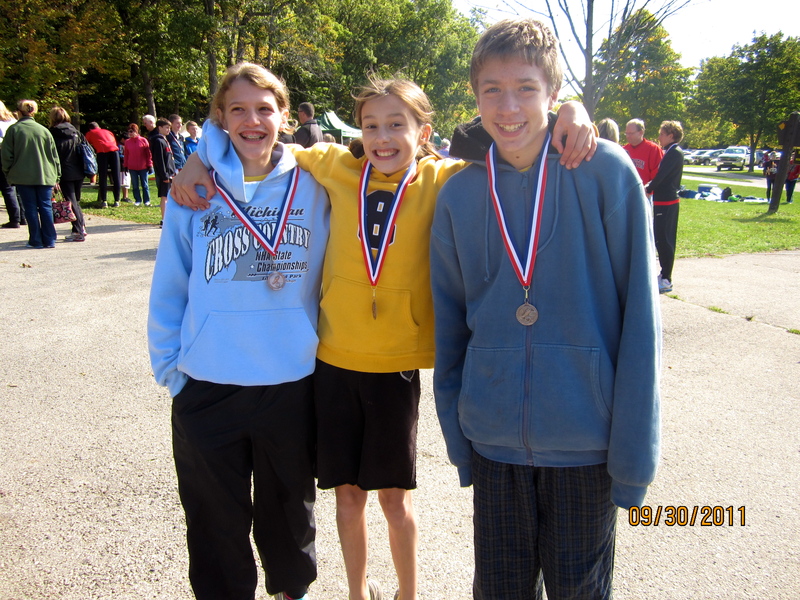 That time ended up getting the 1st place 7th grade medal, and he won it by 16 seconds! Oh, yeah! Micah Chan impressed the DASH fans once again. His charge up the hill moved him up to 19th place in that overly tough 8th grade division. Our really good little boys started coming in next. Josiah Chu was the first to hit the finish this time. His 10:35 kept him ahead of Charlie Johnson and Noah Caspers. Charlie recovered from a slow start to place right behind Josiah in the 6th grade race. Noah really pushed Josiah and Charlie along, with our star 3rd grader posting a very nice 10:54 time. 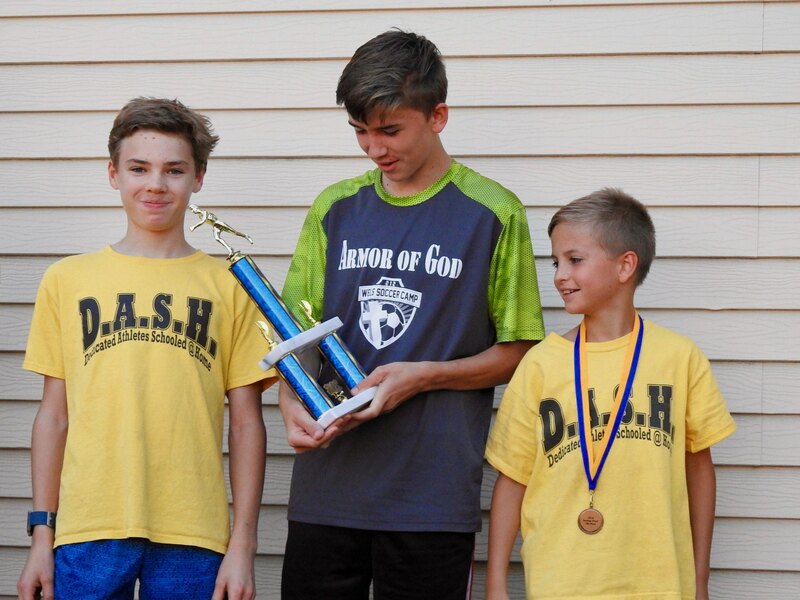 I would say some more nice things about these three, but they were really four, as 2nd grade Ephraim Radtke made his DASH debut in style. Ephraim showed off his immense talent, moving up considerably as the race went along and hitting the finish in 11:18. Compare these four boys times to the award-winning girls times and you will see how fast these guys were going. So impressive! Silas Johnson powered his way to a nice 11:27 time. He looked pretty good for a first race of the season. Joshua Lipski was our last runner in again, and yet he is running so well. Our boys this year are all running in the top half of the race, and that has me bragging a lot. Well done, guys. In such a big meet we were bound to have a few disappointments mixed in, but after finally getting through writing about all the six races above, I am a little overanxious to get on to our next meets. This is turning out to be one of my hardest working teams, and the fruits of their labor is becoming more apparent each time out. Wednesday middle school, and Friday high school meets are next up. I hope to see you there. There is too much running around at this meet for me to do it all myself, so thanks go out to Mr. Beck and even Mrs. Kempf for their help with the coaching. 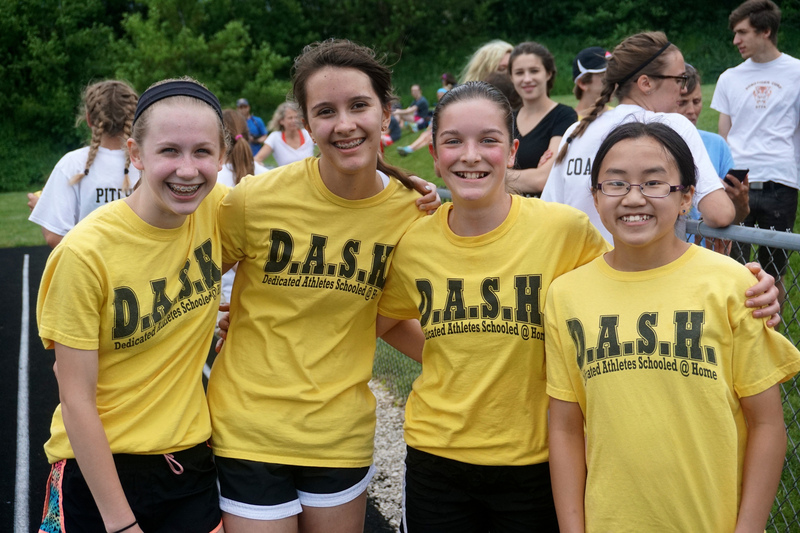 I saw a lot of great pictures of DASH fans cheering the athletes on, many of who were even wearing DASH yellow. Thanks to all of you. Getting photos at Minooka is a truly big task. I always have to run around and take many myself, but I had Grace Caspers and Julianna Caspers helping out in the JV races, and Zipporah Caspers saved my day by taking the majority of the photos in the other four races. Special thanks to them. The photos turned out mostly good, so be sure to check them out. 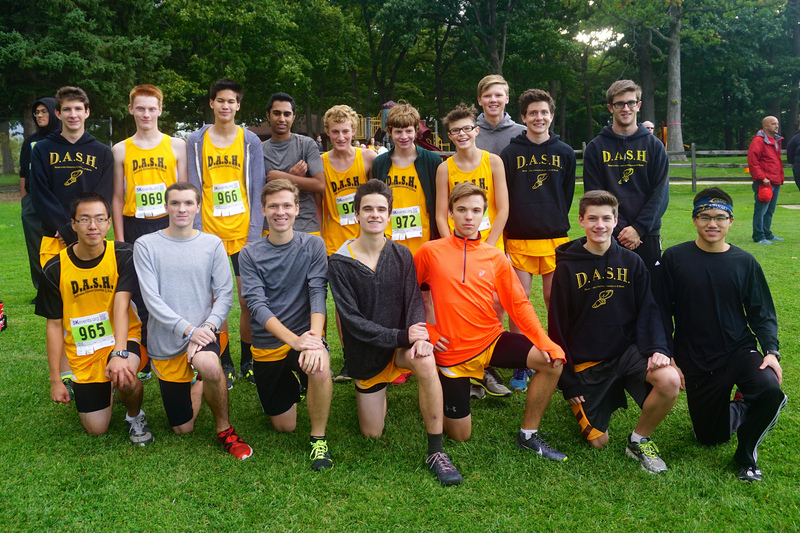 The DASH high school cross country team was back at Hales Corners Park for the second year in a row to race in the Whitnall Invitational. The warm, humid, rainy weather from earlier in the week was gone, but the course was left very soft and muddy in spots. The fast course would not be running especially fast this time out. This was already the team’s third meet on the schedule, so we would be looking to start running some good mid-season times, with hopes of being near the top when listening for the team scores to be called out at the end of the meet. Below is a rundown of the four races. The JV girls took the field first at 4 PM. Katrina Lipski got out fast and cruised to a nice 18th place finish with a season best 28:41 time. Naomi Zhou looked good at times and hit the finish in just over 35 minutes. We also had two cross country rookies compete with only two practices behind them. Shariah Hyler and Sandrelee Velez both struggled at times over the 5k course, but they also showed some great running in spurts. They have a lot of potential, and with a couple more weeks of practice, Shariah and Sandrelee should be posting some much lower times. Stay tuned. The JV boys all had good days. Jacob Parker looked smooth and fast over the whole course and clocked in with a nice 21:50, good for 13th place. Matthew Schaber had his best race of the season with a 24th place 22:48. Jacarie Rucker lowered his time by over 4 minutes to place 44th overall out of the 88 finishers. We will be filling out the varsity roster in the meets ahead. These boys look ready. The varsity girls were next. Abby Chu just missed a top-10 medal last year, but this time she moved up into the top-10 halfway through the first mile, and held her ground the rest of the way to finish 8th overall with a 22:04. Stephanie Chu stayed up close to Abby and battled her way onto the medal stand by the finish. It would be 22:20 and 10th place for Stephanie. Very well earned. Alivia Kempf showed off her nice stride as she kept up a fast, steady pace throughout to post a 23:00 and give us three among the top 17. None of the teams behind us were close to having as good a 3rd runner as Alivia. We were able to get our 4th and 5th runners in much sooner this time which was one of our goals. Katie Gorectke is rounding into form now. She lowered her season best time by close to 3 minutes with a 25:01. That’s what we were hoping for out of Katie, and I doubt she has peaked yet. Emma Taylor ran close to Katie the whole way and also lowered her time into the low 25’s. We have counted on Emma to come up big for us and she has not disappointed. Ella Johnson kept the good results coming as she broke 26 minutes for the first time this year. Faith Caspers looked much better this time out, but was slowed some as she was not wearing spikes. She is close to a breakout meet. The varsity boys race started out fast with our boys running in the pack, but as the race went on the DASH fans were treated to seeing DASH yellow moving up. Caleb Schaber made an 18:23 time look easy as he made the medal stand with an impressive 8th place. Alexander Taylor had an incredible last half of the race, moving all the way up to 12th place by the finish. Alex sets big goals for himself, and he hit it this time with his 18:46. Drake Hacker is getting faster each week and he gave us three in the top-18 with a nice 19:11 time. Moments later, Kaden Hacker charged in with a personal best 19:29. That gave us four in the top-22. These boys were having a big day. Joshua Schaber never faltered as he continues to get his times down by almost a minute each meet. His season best now stands at 20:55. Vincent Maurer moved up in the last mile to get a 21:41. He is rounding into form now and has his best meets in front of him. It was a big day for us individually with three top-10 medals. We also impressed with our team showing. The girls finished 4th again, but ahead of a team that beat us earlier in the season. The boys were 3rd, six points out of 2nd. If the out of place Division 1 Waukesha North team had not been a late edition, we could say the boys just missed out on a win. Next up is the tough Minooka Park course with mostly Division 1 competition. That should toughen us up some, and help us get ready to peak for our smaller meets after that. I can hardly wait. Thanks to Ed Beck, Chuck Maurer, and Dawn Kempf for their help with the coaching. 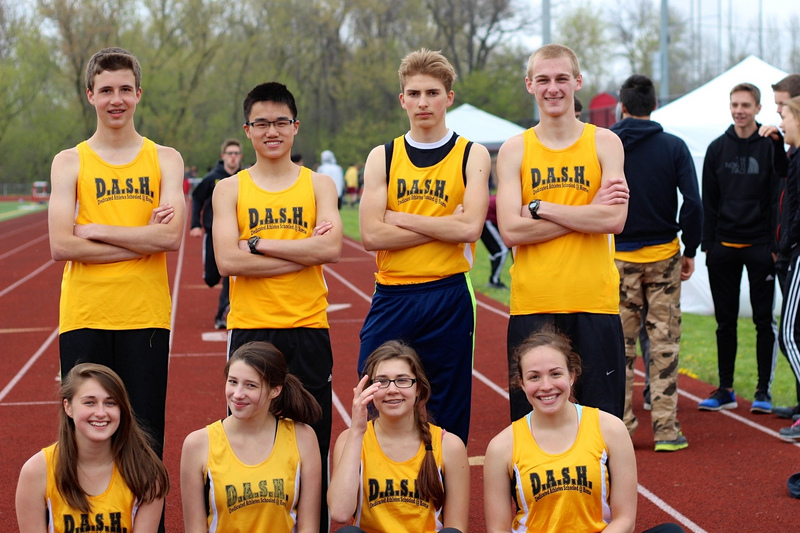 Thanks to Whitnall for putting on a great meet after all the rain we have had. Other meets are getting cancelled. Thanks to the camera crew of Grace Caspers and Julianna Caspers. We got plenty of good photos that caught the action. Now we get to put in a few good practices before we do it again. I hope to see you there. 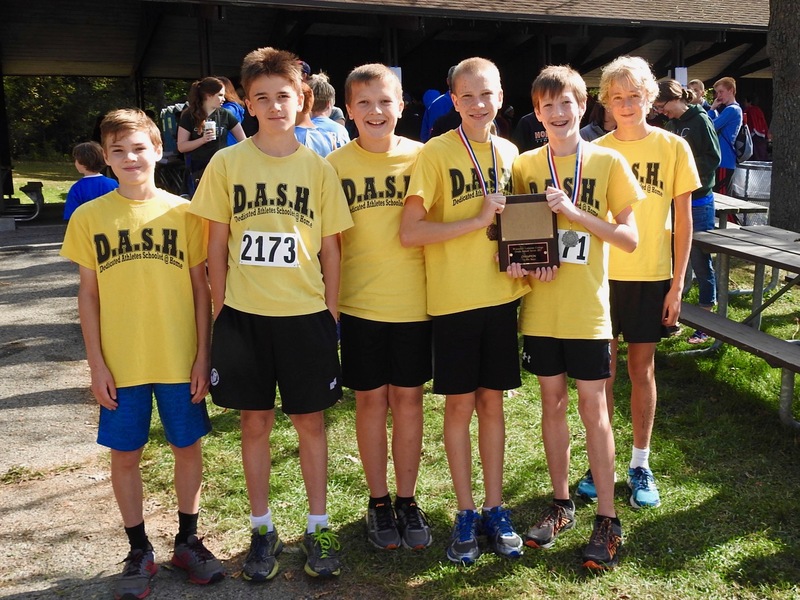 The DASH high school cross country team competed at the famed UW-Parkside course for the first time yesterday in a meet hosted by Kenosha St Joseph’s. It was a particularly warm and humid day with rain in the forecast. To help assure that everyone would get to run, the meet organizers decided to have the girls start exactly 10 minutes after the boys. It proved to be a wise decision as the rain did come just as the girls were finishing up. The DASH fans and the camera crew had to be especially attentive as the boys and girls were all out on the course at the same time for a while. After 41 minutes of racing all of our athletes had made it in. 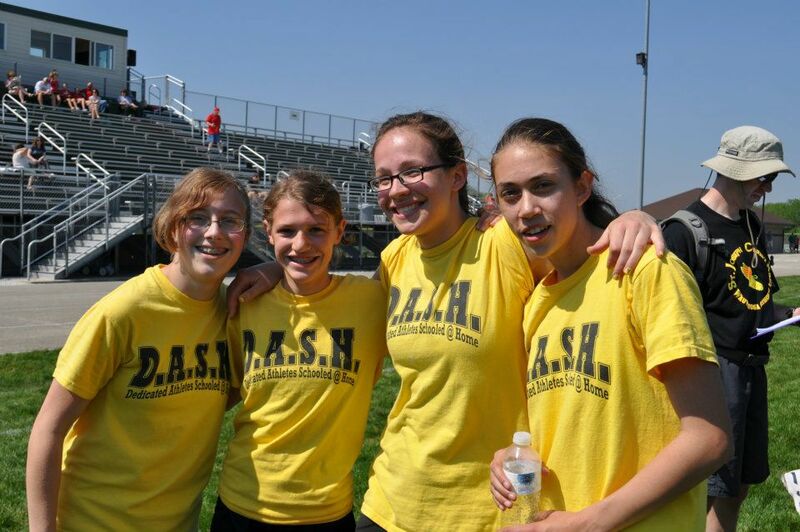 Definitely a DASH record for fastest meet. The boys were ready in box 1 for the 4:30 start with the girls waiting to move in as soon as they got started. After going up the first big hill, and then winding their way through the woods back down the hill, Caleb Schaber was the first to be seen. Caleb moved well in the heat and beat his time from last week with a 19:05, good for 14th place and the medal stand. Star freshman Alexander Taylor got out fast and held on to be our 2nd runner in. Brian Durbin was running probably for the last time for us as he prepares to go off to school this weekend. Brian left some of his lunch on the hill by the 2 mile mark, but then made a late surge to finish right behind Alex. Kaden Hacker set a personal record in the heat and kept Alex and Brian in his sights. Our other star freshman’s 20:30 time and 36th place finish was exceptional. Drake Hacker battled his way through the tough conditions to finish 41st overall. Drake is the big guy on the varsity time. His times will be coming down considerably as the weather cools. Joshua Schaber was our 6th runner again. This time he was able stay ahead of the 4th runner on all the teams finishing behind us. We don’t have a big team this year, but it is our depth that is keeping those teams behind us. Vincent Maurer did not have his usual late push probably because of the heat. With Brian helping us out this time, hopefully he is saving his best races for the big meets ahead. Matthew Schaber gave us three freshman in the top-15 and he hasn’t shown us his best racing yet. Jacob Parker told me he was tired before the race and it showed. Hopefully he will be back looking as good he did last week next time. Abby and Stephanie Chu have done well in the past in warm conditions and they did it again. Abby and Stephanie ran side by side most of the way with Abby hitting the finish line first this time. The girls placed 6th and 7th overall with times in the low 23’s. Very nice. Alivia Kempf also earned her second top-15 medal of the season with her 14th place finish. Abby, Stephanie, and Alivia have been an outstanding trio thus far, and we are making progress getting the rest of the girls to move up close behind them. Emma Taylor is not known for running well in these kind of conditions, but she toughed out a good race to be our 4th runner in once again. Katie Gorectke was outstanding the first half of the course, and then hung on to be our 5th runner in. Katie is rounding into form now and should be a fixture on the varsity squad the rest of the way. Ella Johnson had a great finish, moving up to edge Faith Caspers in the end. Faith is still dealing with blisters on her heals from last week and the heat wore on Ella early on. They will be getting their times down considerably in the weeks ahead. As will Katrina Lipski who did not post her best time of the season, but is looking in form and is waiting for some better conditions to show off her stride. Our team scores were very respectable for this early in the season. The girls placed a close 4th once again, and the boys were in the mix with a 6th place showing. The team is about where we would like it to be thus far, but our competition will be improving as the season goes along. 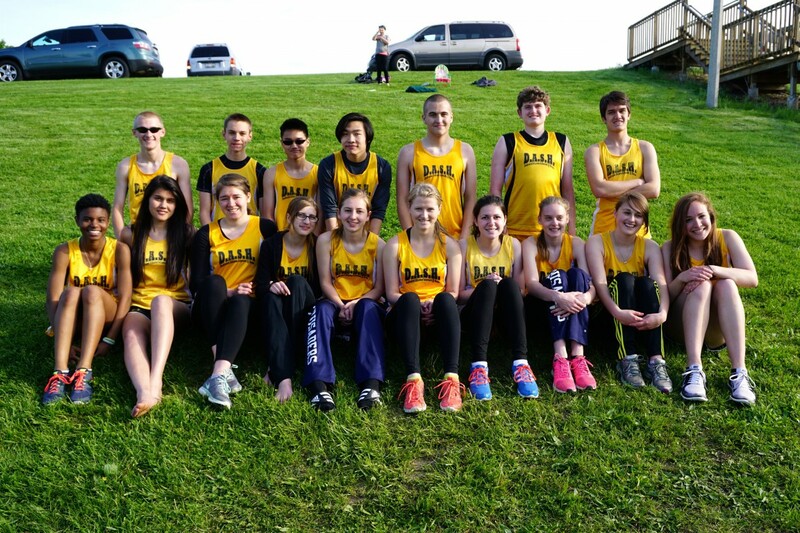 We have nine days to improve ourselves and get ready for our next big meet at Hales Corners Park. I hope to see you there. Thanks to Dawn Kempf for her help with the coaching. Thanks to the staff at St Joseph’s for being aware of the weather situation and getting the meet completed. Thanks to our camera crew of Julianna and Grace Caspers. They did their best running around to catch as much of the action as they could in photos. Thanks to all the DASH fans for making the trip down to UW-Parkside. The meet got good reviews so we should be back again next year, hopefully with better weather and better traffic conditions. 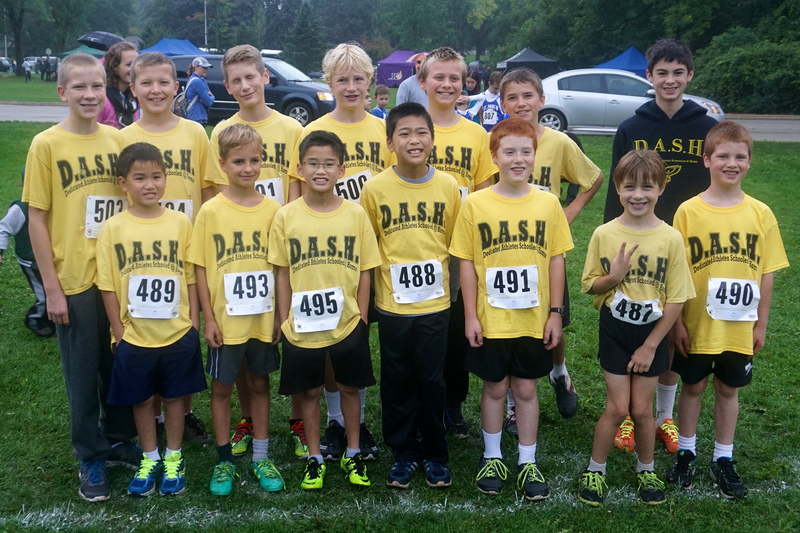 The DASH high school cross country team got another season started, their 11th, yesterday at Kettle Moraine Lutheran high school. It was a beautiful, party sunny day with a cool breeze blowing in the background. The rain from earlier in the week made the low grounds of the course a bit soft, so the course was not running fast. Nonetheless, after several weeks of practice, it was time to see how our promising team would stack up against some 11 other teams this early in the season. The varsity boys were first on the program. Caleb Schaber got out to a fast start in his quest for a top-20 medal. He held on and achieved his hardware goal with a 14th place finish. Freshman Alexander Taylor did not let the longer 5k high school distance slow him down at all. He also made it to the medal stand in 18th place with an impressive time of 19:36. Drake Hacker is rounding into running shape after a summer of cross country ski training. Drake gave us a solid 26th place finish and will only get faster as the season goes on. Freshman Kaden Hacker showed off his effortless, smooth stride for the first time at the high school level. His 28th place finish was one of the keys to our good team score. Vincent Maurer laced up his spikes once again for us. He moved up over the last mile to be our 5th runner in. He will one of the keys to our season. Joshua Schaber stayed steady through the course, and stayed ahead of the 5th runner of all the teams behind us, thereby pushing up their team scores. Mission accomplished. Well done. The varsity girls lined up next. The first half of the race, Abby Chu, Stephanie Chu, and Alivia Kempf ran together with all three girls staying in the top-12. In the last mile Stephanie Chu showed off her speed while moving up all the way to 7th place by the finish. Stephanie even knew when to smile for the camera as she ran by. A most accomplished effort. After just missing out on a top-20 medal last year, Abby Chu gave us a second girl in the top-10. That has to get you excited. Alivia Kempf set a personal record 23:29 on the slow course. That was a medal-winning 13th place effort. I see a big season ahead for Alivia. Emma Taylor started conservatively, but really got into racing mode down the stretch to place 32nd overall. Emma will be needed more than ever this season. Delaney Regan got off to a great start in her first high school cross country race before getting slowed down some in the softer, muddier sections of the course. She picked it up near the end to place 41st overall. She will be one to keep an eye on as the season progresses. She can run. Faith Caspers needs new spikes. She left the course with bloody heals and a poor time while holding her spikes at the finish. She will be back much faster next time. 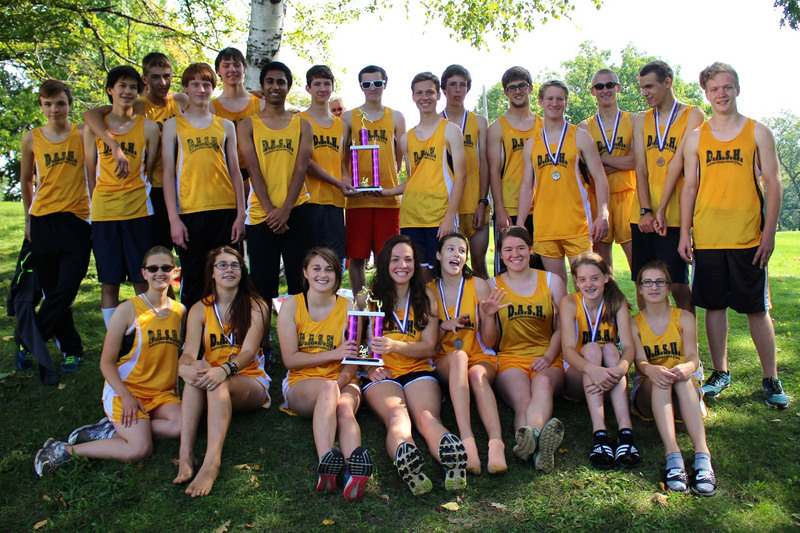 The girls and boys race together at this meet in the JV race. Ella Johnson showed us that she may be too fast to keep off the varsity squad as she placed 7th overall among the girls with a time of 27:30. Ella has put in the miles and is running well. Jacob Parker has looked pretty good at times in practice, but never as good as he did at the meet. In his first cross country race, Jacob stayed fast the whole way and finished 20th overall. He may also be running some with the varsity squad before the year is done. Katrina Lipski set her personal record on this course as she continues to run well. She earned the 28th place ribbon for her effort. Matthew Schaber ran a very controlled race and placed 29th overall. He will have a breakout race sometime this year. Stay tuned. Katie Gorectke got off to a fast start, then struggled through the course. With a little more time, conditioning, and confidence her times will come down considerably. Jacarie Rucker made it to the start just in time, missing the team photo. Jacarie struggled the second half of his first cross country race, but he has looked good in practice, and will get better with a few more races under his belt. Naomi Zhou wasn’t at her best this time out. She finished in 37:30. We will work on getting her to start a little faster and her times will come down. We have never been very successful at this meet in the past. I have thought of it as getting our bad meet out of the way early. 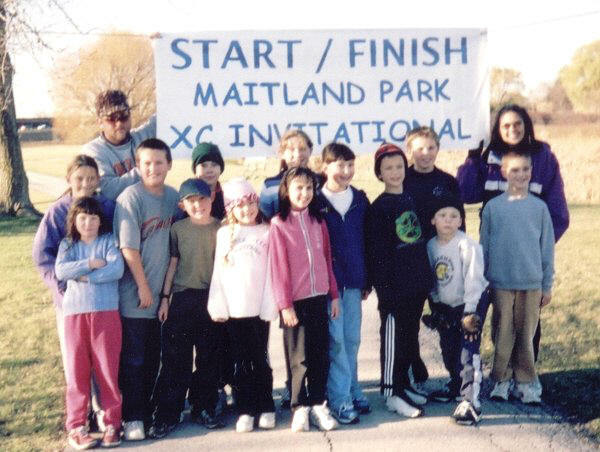 This was the year we finally broke out of that rut and ran well. It was a relief to witness the boys capture the 3rd place medals, finishing ahead of 4th by 10 points. That was our first top-3 finish at this meet. The girls almost matched the boys, but finished just one point out of 3rd. So close! The important thing is that we ran like we should be running this time of year. We could have even done a little better, but we were missing one of our new stars, Terez Wycklendt, who is out with a foot injury. Terez loves to run, so we pray that she can join us again later in the year and get in on the fun. We need her energy. Thanks to Ed Beck and Dawn Kempf for their help with the coaching. Thanks to Bill Taylor, Laura Gorectke, and everyone else who helped pass out racing bibs and chip timers. Thanks to the DASH fans for making the trip up to Jackson, and for the staff at Kettle Moraine Lutheran for hosting a great meet. 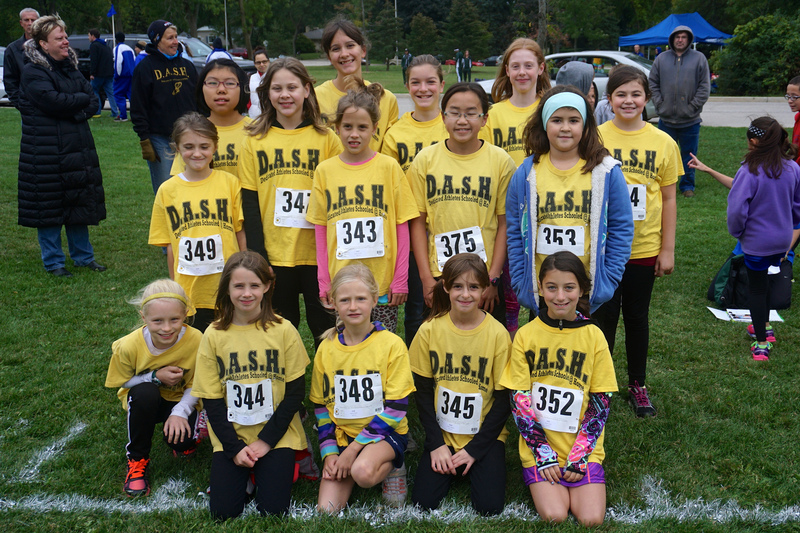 Thanks to Julianna Caspers and Grace Caspers for taking the photos of the varsity races. The JV team has to thank yours truly and Noah Caspers for the photos of their race as the girls ran off on me before the job was done. The photos turned out all right for a first meet of the year. We have seven meets left on the schedule, including one coming up this Tuesday. I am looking forward to it. I hope to see you there.